Jeff Lemire and Andrea Sorrentino are back with another awesome collaboration, this time on a creator-owned project through Image Comics. The duo brought the world an amazing run on Green Arrow and brought back a fan favorite in their run on Old Man Logan. 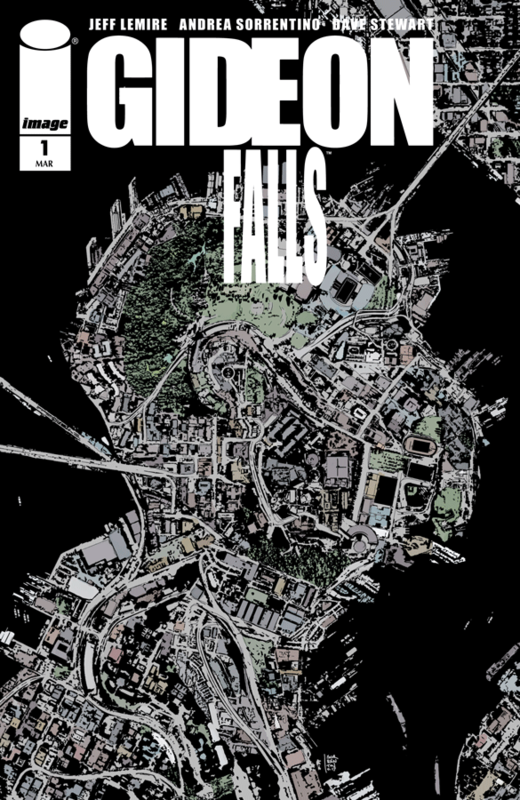 Now, with Gideon Falls, we get a look at the horrific supernatural in a small town in America. The book centers around a recently transferred priest, Father Wilfred, who is assigned to Gideon Falls after the previous priest passed away. It also centers around Norton, a seemingly unwell man who feels he is coming face to face with evil through the trash he sifts through. But when the recently deceased Father Tom appears to Wilfred, it sends the lives of our protagonist spiraling into the unknown. Norton sees Wilfred, but how is that possible? There’s a connection far deeper than the physical world. The world we see here is one full of mystery and blurred lines. What is reality and what isn’t is not clear, and that is part of the charm of this book. What brought Wilfred to this land? And is Norton just sick or does he literally see something that the rest of us don’t? If so, why him? The questions are poised and ready to be revealed but in due time. Lemire crafts an introduction to a world dripping with evil. Wilfred and Norton, two people that have zero in common, are about to be thrust into a fight against the supernatural, and there’s already been a casualty. Sorrentino’s artwork is a great fit for such a book, as it evokes fear and horror when needed. There are scenes here that will send a chill down your spine, including the shocking last page. I loved this debut issue, and cannot wait to see what lies inside Gideon Falls.